An Efficient way of doing or achieving something. > What is Test Design Technique? A test design technique is used to select a good set of tests from the all possible tests for a given system. > Why we need to use Test Design Techniques? Exhaustive Testing is not possible, so we need to use Test Design Techniques in order to reduce the size of the input. Exhaustive Testing is a Test approach in which the test suite comprises all combination of input values and preconditions. Exhaustive Testing is not recommendable due to Time and Budget considerations. > Categories of Test Design Techniques? > Testing of the software documents manually or with a set of tools but without executing the Software. > The software is tested by executing it on computer. • In Equivalence Partitioning, inputs to the Software are divided into groups that are expected to exhibit similar behavior. • Equivalence Partitions/Classes can be found for both valid data and invalid data. Tickets field in a Reservation system accepts 1 to 10 Tickets only. Customer Identification Number field in a CRM system accepts only numbers. 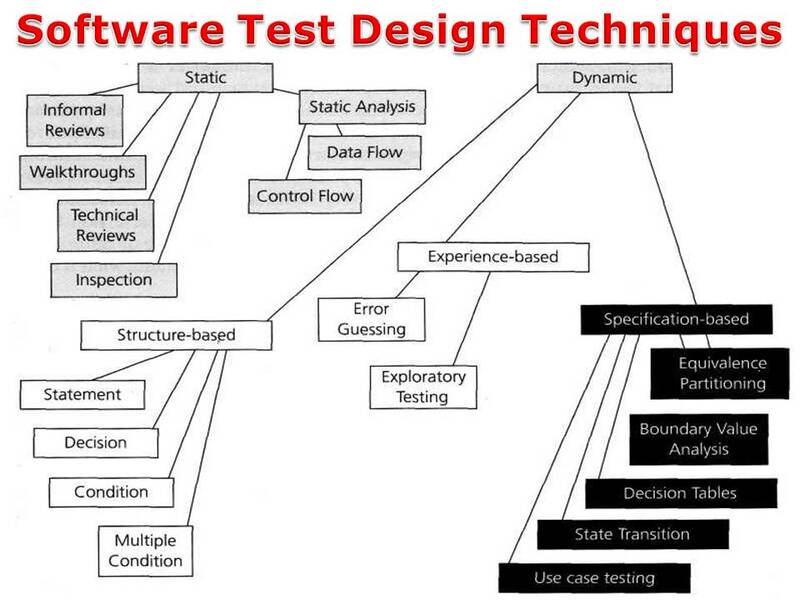 Software Test Design & Development. • The maximum and minimum values of a partition are its boundary values. • Behavior at edge of each equivalence partition is more likely to be incorrect than behavior within the partition. • Boundary value analysis can be applied at all Test levels(Unit, Integration, System and Acceptance Testing). • The decision tables are good way to capture system requirements that contain logical conditions. • It may be applied for all situations when the action of the software depends on logical decisions. Banking System interest rates For fixed deposits. • In State transition Testing Test cases are designed to execute valid and invalid state transitions. • A System (Application Under Test) may exhibit a different response on current conditions or previous history. • In Use Case Testing Test Cases are designed to execute User Scenarios or Business Scenarios. • A Use Case describes interactions between actors, including users and the system. • A Use case usually has a mainstream scenario and sometimes alternative scenarios.